Making the case for band autonomy. There are several other tribes in Northern California with varied histories of both long recognition and not recognised as well as recently recognised. These modern tribal groups formulate tribal rolls, establish councils, and operate buisness entities acting as individial bands of a larger tribal group. 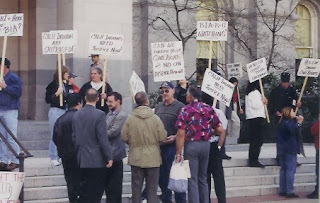 Tribal groups are related pre-historic peoples that share a linguistic stock, and both recent or historic fracturing of tribal memberships into "bands" or modern eminations of more traditional tribal linguistic groups have occoured in California. This relatively new caveat of federal Indian Policy has seen pre-historic tribal bands or "tribelets" morphing into Traditional Bands, and the actions have created some backlash for both the tribes and the Federal Government thru which the Bureau of Indian Affairs has oversite over the tribal governments. Examples abound. The Enterprise Rancheria split into rival factions after poltical diputes boiled. The Pit River Tribe remains 11 auntounomous bands and their Tribal Constitution and their election ordiances and election districts reflect that traditional ideal, by following traditional tribal guidlines. The Shasta Tribe of Siskiyou County split into rival petitioners thru BIA's OFA process for recognition, when they would be better off together. The Pomo of Mendocino Lake and Glenn Counties still remain federally recognised as seperate Pomo entities while still retaining their band auntonomy on over 18 seperate Rancheria's. The Yurok Tribal membership is spread. between 4 different rancheria's in addition to their reservation. And their tribal elections also reflect traditional band boundaries for voting districts. It seems important for other tribes to utilize tradition in a tribes political structure to assure integrity and well being in the membership. And it promotes understanding in our traditional structure, somthing many Wintu yurn for, including people like the Curl-Malone Board Members, that have no tradition in their lives, and as a result to this lack, react violently to others and abuse their own family. Only thru aknowlegement of our traditional Wintu past and understanding of it, will any of the Wintu grow in the future and become closer to who we really are, not what the government wants us to be. What's a tribal linguistic group? You ask. 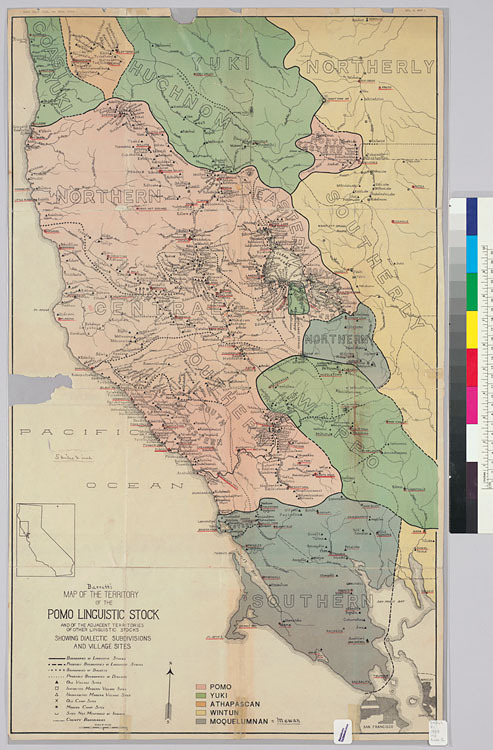 Yes, most California tribes are loosely termed in related language families (California Language Geograpy Map), groups like Hokan, which encompass all the Pomo, Karuk, and Chimariko people. By classing linguistic "stocks", scientists, or better, linguists, can group tribes by related languages that have been proven thru research to be related. In theory. I use the term loosely as linguistic morphology is a relatively new field and a few languages need classing still like Wappo, and Yuki, and some may be re-classed in future studies, like Chimariko or New River Shasta/ Pit River. Because much of linguistic study is based on conjecture and scientific hypothesis they are relatively educated guesses. And still yet, some of these groups have yet to form any kind of tribal governace to protect their people at all. So where does that leave a Penutian speaking group like the Wintu? Only the Nor-Rel-Muk and We-na-mem exist today as modern political morphs of tradtitional Wintu band units. 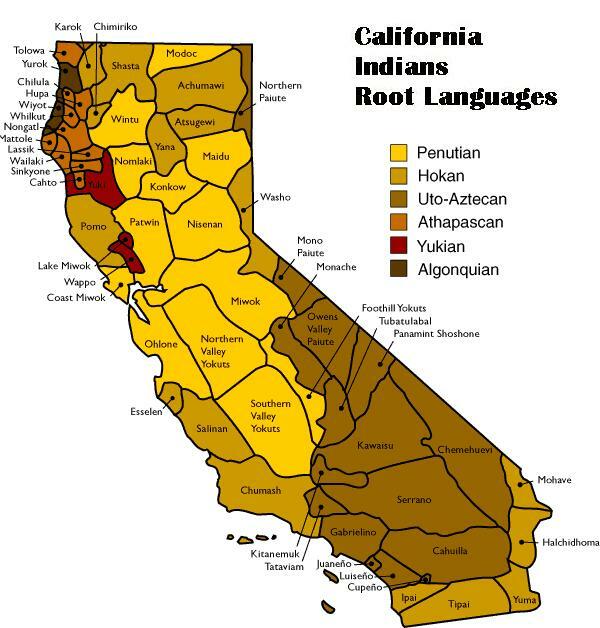 The Toyon Tribe (Wintu of Northern California) are a historical tribe, and do not reresent the pre-historical entity, our our ancestral rights, The Toyon Wintu Tribe was established when Toyon, the facility, was occupied in 1971, and recognised by the federal governement from 1971 until today. The United Bands by its own name beguiles the idea that the tribe is somehow a united group of the Wintu bands, an impossibility as the members are spread between 6 modern tribes. But it also is deceptive as to its membership being all inclusive, which it is not. Another problem with the modern We-na-mem tribal membership, not all the members know who they are or what villages they come from or are of a mixed ancestry as the tribe receeded to the safety of the McCloud River after 1850 to retreat from the onset of murderous miners and settlers. The pre-historic link of band to modern tribal entitiy is merely half the story of cultural revitalization and cultural renewal and is seperate from the NECESSITY of a given tribal membership to fracture. Illegal elections? Power hungry families that only think for themselves and abuse others? Decades with no action on our petitions for recognition? Strong-arming elders? Violations of federal laws like the Brown Act, and Free Speech? Violations of Civil Rights to Equal Protection? These kinds of unfortuante occourances are what has lead up-to and continues to plauge all of indian country, not just the Wintu Tribes. Caleen left to formulate the We-na-mem to fill the void for spirituality and truth thru band acknowlgement that the Curl- and Malone Families cannot offer their members. The United Bands was created when the members became the majority and after being abused and having their rights violated by the Curl's and Malone's they broke away and formulated one of the most sucessful Wintu Factions. The El-Pom Keswick Rancheria was created in 1998 when simple Welfare, Housing and Cultural Issues simply were not being addressed by the Toyon/Wintu, Curl-Malone Board, and for the fear that surrounds all tribal members when dis-honest people are allowed to remain in control. Abuses nescessitaed the fracturing of the Wintu Tribe. And for Recognition the Federal Government Nescecitates that we re-unite. It seems that the simple metamorphasis that is occouring is for the Wintu Bands that are still alive today, that still have their ways, that still know who they are, that still care for there places. To formulate. Because there are still hundreds of members out there that have no connectivity, no culture. And if any tribal council wishes to operate for the tribe, they ought to begin by acting like it.